As someone who enjoys good food and fine dining, I was a bit skeptical about a cooking school invite. After all, the reason I write so much about food is because I'm usually sitting in a restaurant versus standing in the kitchen. I just don't enjoy cooking. Mostly because I don't do it well. Any time I have attempted to make a meal for my family, there's usually a smoke alarm going off -that signals that it's time to call for delivery or take-out. De Gustibus intentionally seeks out chefs who are usually well-known. The attendees don't *do* any of the cooking (at least not in the class I attended), so it's safe for the novice as well as the advanced on-lookers. Chefs do the cooking in a state-of-the-art kitchen, while "students" observe, ask questions, and enjoy a five-course, four-star meal paired with wine. No getting up and down. No work. Just sit, listen and savor. On their website, they say, "De Gustibus is not just a cooking school; it's a culinary theater." Add to the fact that the wine pairings are included with the cost and ... well, I'm all in. Most remarkably, De Gustibus Cooking School did something for me that I didn't think was possible: I became interested in the process. In fact, the demonstration class I attended, I was genuinely amazed. 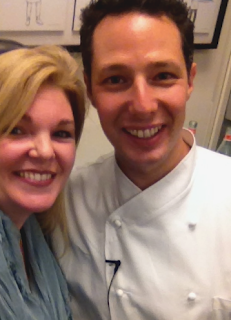 Chef Mark Lapico of Michelin-rated Jean-Georges NYC engaged the class in an informative, intelligent way. He has a knack for explaining very complicated recipes in a simple way. 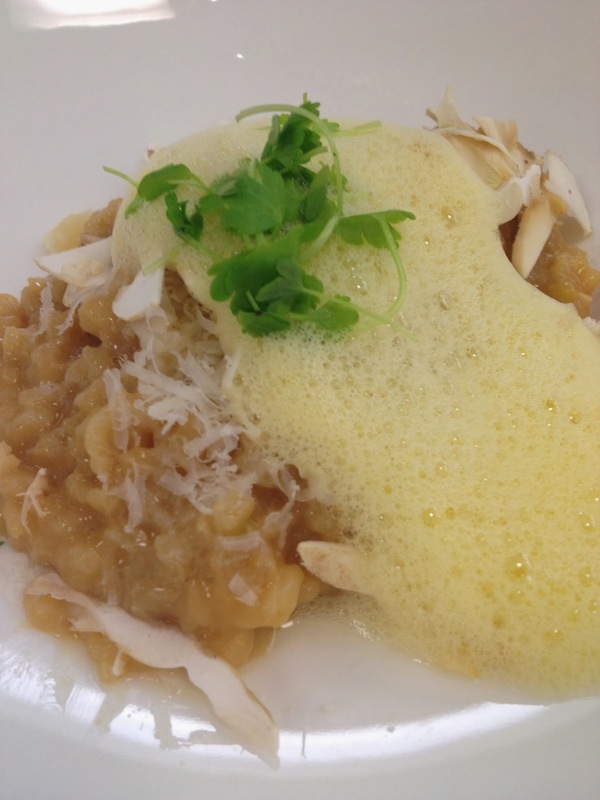 For example, instead of using heavy chicken stock and butter in various dishes, Chef specializes in making "teas" that act as a base for his risotto and peekytoe crab dumpling broth. The whole class practically gasped when he mentioned a secret ingredient to one of the teas was... (no joke)... burnt microwave popcorn! Along the way, Chef would also tell side stories about how he recently climbed Machu Picchu with his wife and 2 year old daughter... He also shared that his version of risotto absolutely infuriated his Italian grandmother (even so she liked the taste, she disapproved of the untraditional preparation) and how the Jean-Georges restaurant sources a good deal of local ingredients -most notably from NYC's Union Square Green Market. And he even shared Jean-Georges nickname, that seemed to stay with him since childhood, "The Palate" - how appropriate! Oh! But I should also mention that going in, I was very skeptical about the idea of the school being inside of Macy's - but once going through the classroom doors, you're completely transported into another space. You really forget that you're in one of the city's biggest tourist locations. It was tucked away from the bustling shoppers and made De Gustibus that much better. All in all, I was really impressed. The whole experience was delightful and delicious. Personally, I would recommend this activity for tourists and locals alike. It is a great destination option for those who enjoy food and it would be a terrific "foodie" experience. If you decide that you want to check out De Gustibus, make sure you tell Salvatore Rizzo -the dedicated director and owner- that I, Victoria from NYC Foodie Girl, sent you. He'll make certain that your time spent in any of their classes is as appetizing as it is theatrical. NYCFG would like to personally thank De Gustibus Cooking School for the complimentary invite (Salvatore and Hao *HUGE THANKS*), Chef Mark Lapico, Pastry Chef Joe Murphy and the entire cooking Jean-Georges team as well as the waitstaff for all of the hard work to make the evening a giant, tasteful success.